Speaking of things that are seaish (C-ish? ), I wasn't able to open the seaish version of your eclipse, Sustainabilizer, but the version is the thread is wowterful. balthasar_s wrote: What does everything stand on? But what does the Earth stand on?! Reminds me of that line from the old Superman movie, where he tells Lois Lane, "Don't worry, miss, I've got you." And she says, "You've got me? Who's got you?" ETA (actually, first I replied instead of editing. ) I never put in a decree, so here's one: Talk about things that are seaish, or C-ish. Last edited by lmjb1964 on Tue Jan 29, 2019 10:59 pm UTC, edited 1 time in total. lmjb1964 wrote: I wasn't able to open the seaish version of your eclipse, Sustainabilizer, but the version is the thread is wowterful. Does any of them work for you? If so, which one(s)? balthasar_s wrote: The big problem of ancient times. What does everything stand on? Also, I'm wondering about the green cottonball. I never heard of such a planet. Must have been discovered very recently. Which is is strange if you see how close to Earth it is. How could we not notice it before? balthasar_s wrote: Also, I'm wondering about the green cottonball. We were busy with the Hubble Deep Field Survey. We were looking deeply into a very small patch of the sky. The Knight Temporals are for real! Dutch artist Suzanne Jongmans has made clothes out of waste and arranged her photos in the mould of old paintings. All he had to do was to redefine "down". what will be our next contradiction? 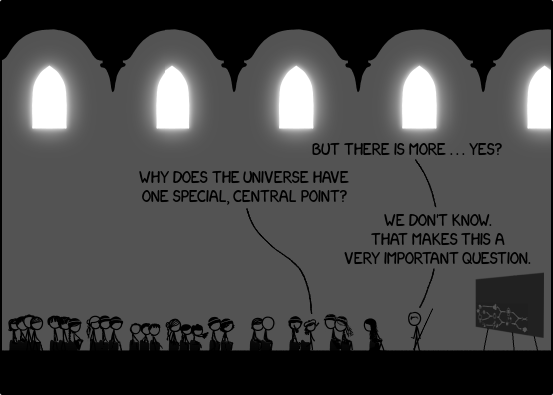 Why does the universe have one special, central point? Wow, steakish! I'll have to look at those in more detail when I'm not on my MTA. 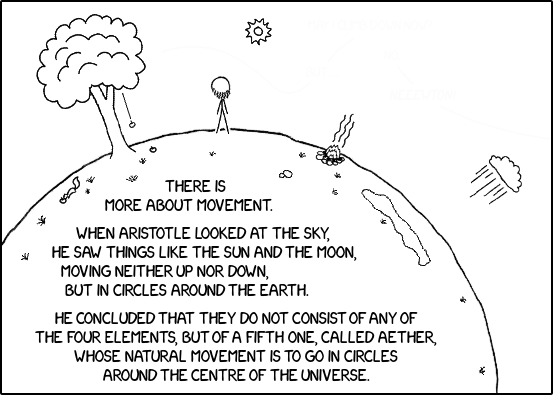 Did Aristotle think there was one point that was the center of the universe? I'm afraid I haven't really read much Aristotle. I definitely know of people who think they're the center of the universe. It's been a while again. Just basement-checking in. It's all fine and well here, if a bit snowy. Hi, thunk! Nice to see you. I'm surprised it's snowing in the basement. Seems like that shouldn't be possible. Should probably have someone look into that. We're having winter storms here, which means lots of rain and wind, possibly with landslides, flash floods, trees down, etc. Good times. You don't have your watch with you. Hmm… what else does she have with her which might help them to survive? 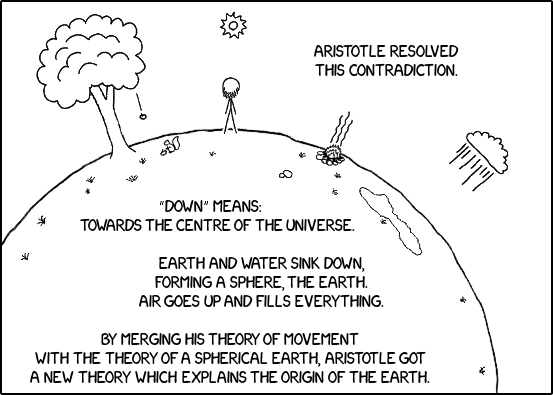 lmjb1964 wrote: Did Aristotle think there was one point that was the center of the universe? lmjb1964 wrote: I'm afraid I haven't really read much Aristotle. I got most of my knowledge about him from Wikipedia. lmjb1964 wrote: I definitely know of people who think they're the center of the universe. 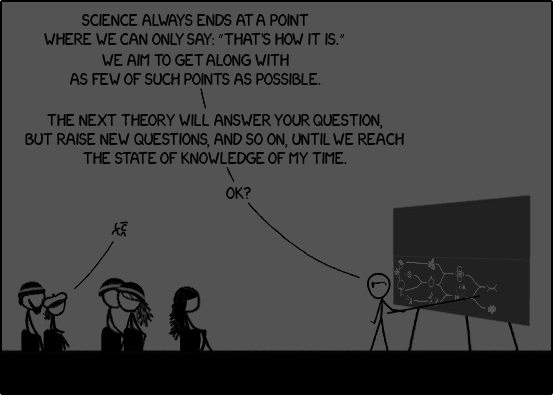 However, according to Einstein's General Relativity, that's a valid point of view. It's just that most calculations get easier when we put something else in the center. If I consider my head the center of the universe, and I turn it by 180°, the Andromeda Galaxy travels a seaish half-circle around my head. That's a distance of π · 2.5 millions of light years within a second – much faster than light. Also, it takes extreme forces to accelerate and decelerate a whole galaxy within that Time. However if I carefully write down all equations, everything turns out correctly: Faster-than-light travel is okay, since no information is transferred, and the extreme forces are precisely provided by the inertial forces in the rotating frame, in particular the Coriolis force and the centrifugal force. It's just easier to calculate when I assume that I am not the center of the universe. But the result is the same. What a delight you are. Hi, addam! Nice to see you here, and not just in Forum Games. 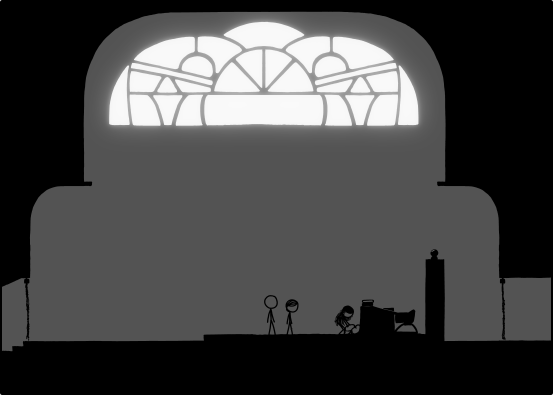 Preview edit--a new phys frame, with an importONG question! GLR is reading the OTT! S&S are reading the OTT! that's not surprising at all. is related because the frame must have been made last minip. (Waves Wildly) Hi! June Bug! I'm more of a Lurker than a Poster these days. Although it's a little surprising, since it suggests the newest frame was written in the last four-five dips. 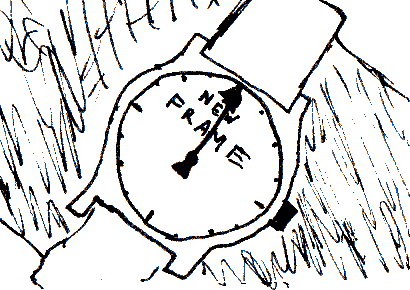 I would have thought the frames would have been done further in advance than that. But maybe it's just a Coincidence that you both used the exact same words. And thanks for relinking to the blitzposting video. That is a lot of work to create a blitzpost! ...can I be extremely lazy and get a tl;dr on why this thread is still active? Didn't Time end years ago? Wowfunhappy wrote: ...can I be extremely lazy and get a tl;dr on why this thread is still active? Didn't Time end years ago? Yes. You can skip pages. No! This thread did Not End. Time is dearly Loved and Important. It is so sweet and smart. So there. Welcome, Wowfunhappy, Revealer the Recent, to the One True Thread! Wowfunhappy wrote: …can I be extremely lazy and get a tl;dr on why this thread is still active? Didn't Time end years ago? Yes, Time ended, but we are keeping up its spirit. 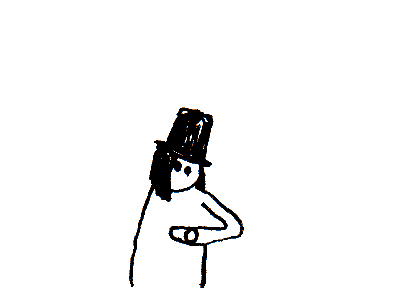 For instance, there are two stories made by forum members and RELATED to Time running right now – see above. We also have movies, literature, songs, and more RELATED stories, including my sequel to Time. If you want to know more, see the Wiki. balthasar_s wrote: Also, this https://youtu.be/oIMNmiZW1t0, 0:25. Yeah. I couldn't resist and re-watched that movie two times in sequence. Awesomeful! Ok, so I had a whole page of text ready to go, and lost it all due to a rogue keypress1. Recreated some of it, the rest can live on in the random thoughts that keep me awake when I'm trying to sleep at 2pm. 7And I just did it again... At least this time I learned to type it in a seperate editor first. I'm still not sure what I hit to wipe the screen (basically just replaced the whole tab with a solid white background, but still thought it was on this page), I've only used this leopard a few timesc1, so not really surprising. 404Apologies for the simplistic footnotes, but I've been trying to post this for a few days now3, at this point I just want to get it out and then head to bed. I-B-Sleepy. wWhyzed are the exotra letters after that one? www.xyzWhere does the 'x' fit into that? 1190Yeah, I just looked it up, I can't help it. [quote="Febrion"]Ok, so I had a whole page of text ready to go, and lost it all due to a rogue keypress1. Recreated some of it, the rest can live on in the random thoughts that keep me awake when I'm trying to sleep at 2pm. Sometimes, control-Back or control-Z will recover that which is lost. But you seem to have given us an enjoyable post in any case. Just noticed there's also a blag post about it. I wonder whether it will feature the steambottleugh. This looks like a lot of work – [one] true dedication. featuring potential contents for the steam bottleUgh. You are the last thing on my mind. 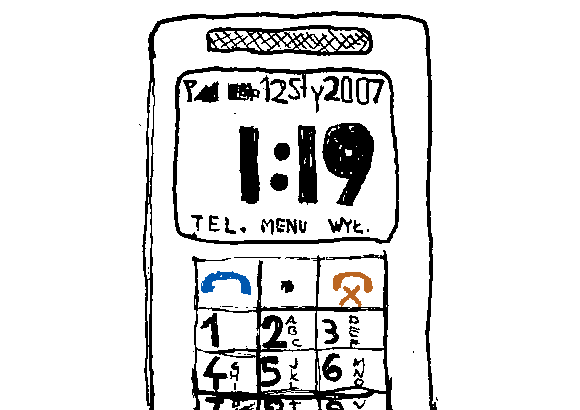 The phone could be useful, it has a clock in it. But it does not show the correct time. Your phone sometimes doesn't want to turn on and the only way to make it work again is to pull the battery out and put it back, but this resets the clock. And you don't feel like setting up the clock every time this happens. So the phone is useless as a time source. But you noticed something else. Something interesting. That the phone has managed to find a mobile network to log into? Well, it looks like kxa and b have not only traveled to the moon, they've traveled to the past. 2007, to be exact (and heretical). What was the year again in the story up to then? But I'd assume that the date including the year displayed by the phone is just as useless as the time, for the same reasons. Useless clocks - one of the themes of BSTA. svenman wrote: What was the year again in the story up to then? But I'd assume that the date including the year displayed by the phone is just as useless as the time, for the same reasons. OK, I blitzed the story up until I found a date. The 23rd of June 2011. (Also, every time I re-blitz I'm reminded how awesomefully funny bsta is.) But thats a very good point, that if the time isn't right on the watch, the date might not be either. What else would be the interesting thing that they found? It does look like they have signal there on the moon, so that is interesting.